Saturn's ocean-harboring moon Enceladus, as seen by NASA's Cassini spacecraft on Aug. 1, 2017. Saturn's possibly habitable moon Enceladus seems to dance in a gorgeous new video captured by NASA's Cassini spacecraft. 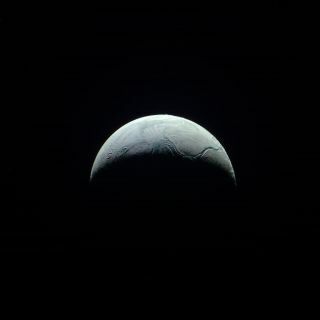 Cassini took the six images that make up the minimovie on Aug. 1, when it was about 112,000 miles (181,000 kilometers) from bright, icy Enceladus. "The heavens often seem vast and unchanging as seen from Earth, but movement in the skies is the norm," Cassini imaging team members wrote in a video description Monday (Sept. 4). "The relative motions of both Cassini and Enceladus over a 15-minute period create the movement seen in this movie sequence." The 313-mile-wide (504 km) Enceladus is one of the most intriguing moons in the solar system. In 2005, Cassini spotted geysers of water vapor and other material blasting into space from "tiger stripe" fractures in Enceladus' south polar region. Mission team members later determined that this water is coming from an ocean beneath the moon's icy shell — and that this ocean may be capable of supporting microbial life. NASA's Cassini spacecraft captured these views of Saturn's moon Enceladus on Aug. 1, 2017, from a distance of about 112,000 miles (181,000 kilometers). Cassini has made a number of other exciting discoveries since arriving in orbit around Saturn on June 30, 2004. For example, the probe spotted seas of liquid hydrocarbons on Titan, the ringed planet's largest moon. Before this find, Earth had been the only cosmic object known to harbor stable bodies of liquid on its surface. But Cassini's work is nearly done. On Sept. 15, the probe — which is running out of fuel — will dive intentionally into Saturn, burning up like a meteor in the planet's thick atmosphere. This suicide maneuver is designed to ensure that Cassini never contaminates Enceladus or Titan with microbes from Earth, NASA officials have said.